Engraving technology took a major leap with the introduction of laser engraving. Old rotary style engraving can’t compete with the versatility and fine detail that can be accomplished with laser engraving. Engraving and custom cut signs bring depth and a sense of permanence and quality to signs. Using many types of materials and clean, clear designs, engraving and laser cutting can make your message and your business stand out. At April Graphics, we use laser engravers, mechanical engravers, dye submission printers and heat presses for custom engraving. 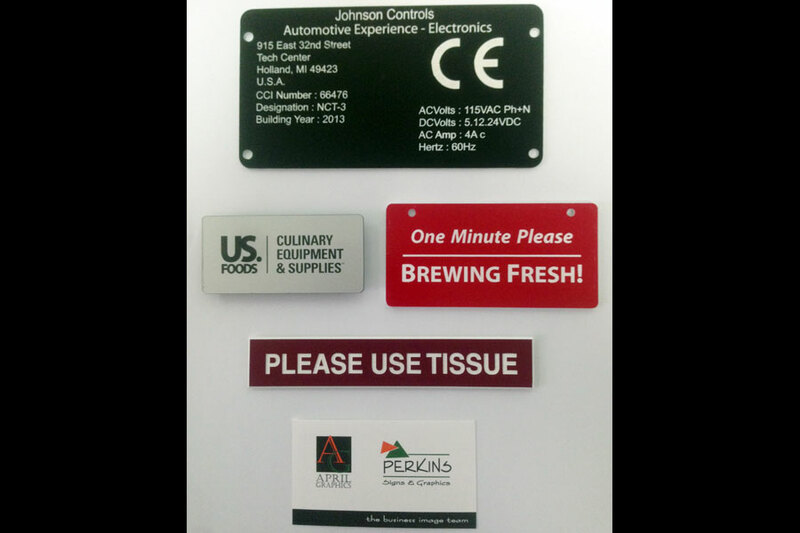 We engrave signs, brass tags, acrylic signs, steel signs, name tags, name badges, aluminum tags, aluminum plaques, award plaques, wood plaques, door plates, desk name plates, Room IDs, control panels, photo etched plaques and Laser cut letters and logos. All possible with April graphics laser engraving technology. If you can envision it, we can probably make it.